Sabarmati Ashram, formerly known as 'Satyagraha Ashram", situated in Ahmedabad at the Kocharab Bungalow of Jivanlal Desai, a barrister. Later on it was shifted to the banks of Sabarmati river and then it came to be known as 'Sabarmati Ashram'. Gandhi stayed at the Ashram from 1915 to 1933 later on the Ashram was disbanded. The Ashram is a witness to many important historical events. "This is the right place for our activities to carry on the search for Truth and develop Fearlessness- for on one side, are the iron bolts of the foreigners, and on the other, thunderbolts of Mother Nature".- This is how Gandhiji described the site of Sabarmati Ashram when he first visited the place for assessing if it was suitable for carrying out his work. The site of 36 acres was a waste land full of snakes, but the order was not to kill them. The Satyagraha Ashram, later renamed as Harijan Ashram, was started in all earnest with a two-fold purpose- one was to carry on the search for Truth, and the other was to create a non-violent group of workers, who would create a non-violent group of workers, who would organize and help to secure freedom for the country. The Satyagraha Ashram was founded on May 25, 1915 in Ahmedabad at Kochrab, when Gandhi returned from South Africa, with 25 inmates. The Ashram was shifted on the bank of river Sabarmati in July 1917. Devoted ashramites led a community life in search of Truth and Non-violence under his guidance. While at Sabarmati, Gandhiji lived in a small cottage which is now known as 'Hridaya (Heart) Kunj'. It is a place of great historic value, where even today visitors find some of the things which Gandhiji used- a writing desk, a khadi kurta, a yarn spun by him and some of his letters. It is on the right hand side of 'Hridaya Kunj'. It is an old Ashram guest house, where guests from India and abroad are put up. Named after Acharya Vinoba Bhave who stayed here, and also known as Mira Kutir after Mirabahen, Gandhiji's disciple, daughter of a British Admiral. It is an open -air prayer ground, situated between 'Hridaya Kunj' and 'Magan Kutir' (the hut where Maganlal Gandhi, the ashram manager, used to stay). Here, Gandhiji used to refer to individual questions after prayers and as the head of the family analysed and gave his solutions. An important feature of the Ashram is Gandhi Sangrahalaya, a museum inaugurated by Jawaharlal Nehru on May10,1963. It has five units and a library, two photo-galleries and an auditorium. The museum houses eight life-sized colour oil- paintings and an exhibition on Gandhiji's life 'My life is My Message' and 'Gandhiji in Ahmedabad'. An archive has also been set up. 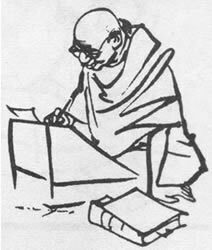 It stores 34,066 letters by Gandhiji, manuscripts of his 8,633 articles, negatives of 6,367 photographs, 134 reels of microfilm of his writings, 210 films on Gandhiji and the freedom struggle. The library has over 30,000 books, 155 letters of felicitation received by Gandhiji, besides a miscellaneous memorabilia comprising of coins, postal stamps and the like. The museum measuring 24,000 sq. feet in area has besides 54 blocks of 20' x 20' each, a conference hall and an auditorium for watching films and video. The Sangrahalaya also arranges for publication and sale of Gandhian literature. The Sangrahalaya remains open for visitors from 8.00 a.m. to 7.00 p.m. on all days including Sundays and Holidays.